This type of sketchy person is literally what got you into this ghoul mess, Kaneki. Note: This review is kind of long and is pretty much a full-on episode summary. There’s just so much going on. Especially that cardigan of Tsukiyama’s. This week’s Tokyo Ghoul was not bad in the sense that we learn some interesting facts about Rize’s death, and we are introduced to new character Tsukiyama Shu (Miyano Mamoru). It has the poor side effect of revealing that Kaneki is indeed a poor judge of character and is painfully naive. Aside from the whole adjusting to life as a ghoul thing going on, two additions are made to the plot: Tsukiyama “Asshat” Shu and his gourmet club, and the fact that Rize’s death could be a murder. I personally am much more interested in Rize’s murder mystery, but most of today’s episode was focused on Tsukiyama “Stranger Danger” Shu. The flashy guy that showed up at the end of last episode is Tsukiyama “Biggest Douche In The Universe” Shu. Touka kindly informs Kaneki that Tsukiyama is considered a ‘pest’ of the 20th Ward, and that Kaneki should watch himself around him. 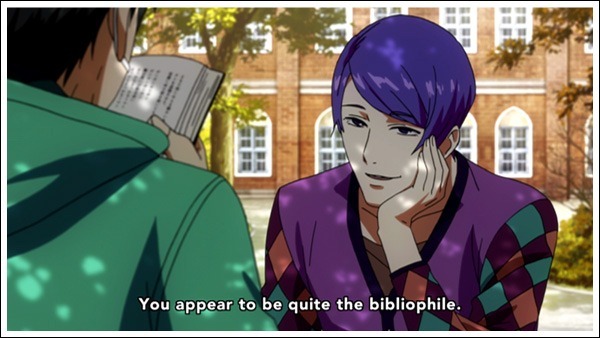 A few minutes into the episode later, Tsukiyama shows up at Kaneki’s university while Kaneki’s reading. They talk about books, and Tsukiyama asks if Kaneki wants to go to a book cafe. Kaneki wisely declines the offer, because he is wary of Tsukiyama. Good boy, Kaneki! But then Tsukiyama brings up Rize and how upset he is at her passing due to the fact that there aren’t many ghouls who like to read. Kaneki then decides to go to the book cafe with Tsukiyama. Bad boy, Kaneki! If you’ll recall, Kaneki got into this mess following a date with Rize, who was attractive to him not only due to her looks, but also her love of literature. Tsukiyama pretty much used the exact same tactic to get alone with Kaneki, including all sorts of sensuous touching when they first met at the cafe. Kaneki is so naive and oblivious, it pains me to watch him sometimes. Sakurai’s character Uta is really cute and endearing! Anyway, another new character introduced is Itori (Takagaki Ayahi), who owns the bar Helter Skelter. She drops some information about how Yomo and Uta used to be crazy rivals, but that’s not the most interesting thing she tells Kaneki. She reveals that Rize’s death may not be an accident, due to the fact that someone saw a person standing atop of the building that crushed Rize and Kaneki. She also tells Kaneki about the existence of one-eyed ghouls like him, which are usually the offspring of a human and a ghoul. Like the half-demons of Inuyasha, half-ghouls are much stronger than their full-blooded counterparts. 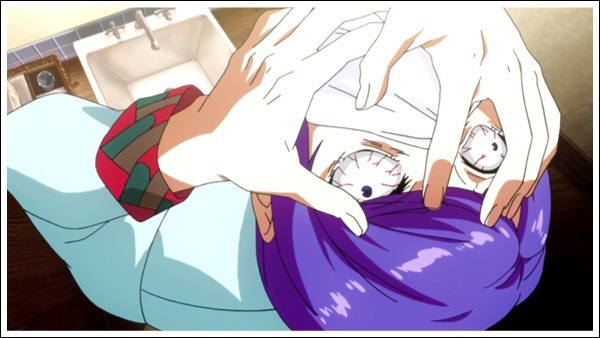 Oh hey, isn’t Kaneki a one-eyed ghoul, too? The plot thickens like congealing blood! At the cafe, there is a flashback to when Tsukiyama asks if Rize wants to join his super-exclusive top-secret gourmet club, which Rize declines because quantity > quality for her, I suppose. To top that off, she makes fun of Tsukiyama by essentially saying he’s playing at being human with his high society club. In the present day, just thinking about Rize laughing at him gets Tsukiyama so worked up he breaks a cup, and Kaneki accidentally slices his finger open trying to help clean up the shards. This is a disaster in the making. Why didn’t Kaneki make up some excuse and leave when he saw how crazy Tsukiyama was getting? Why did Kaneki accept his offer to go to ~Rize’s favourite place~? Why, Kaneki? Why? Kaneki would be the first to die if this was an ordinary horror film. Like, seriously. Here is Tsukiyama sniffing at the handkerchief he used to clean up Kaneki’s blood. He has very interesting fashion sense. The ‘secret place’ ends up being a secret ring where Tsukiyama’s super-exclusive top-secret gourmet club meets and eats. 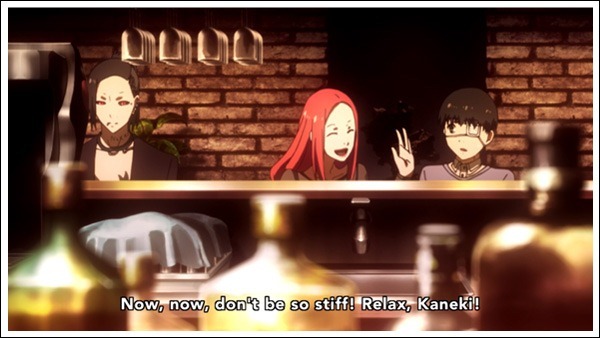 Kaneki is invited as a V.I.P., in the sense that everyone’s going to be dining on him. He almost gets killed by Taro-chan, a huge ghoul with some sort of mental deficiency, but escapes death at the last moment when Tsukiyama intervenes, stating that the main dish has been changed from Kaneki to Taro. This is because everyone saw Kaneki’s single ghoul eye, and Tsukiyama decides that the only person who gets to eat Kaneki is him. All the bad vibes in the world. 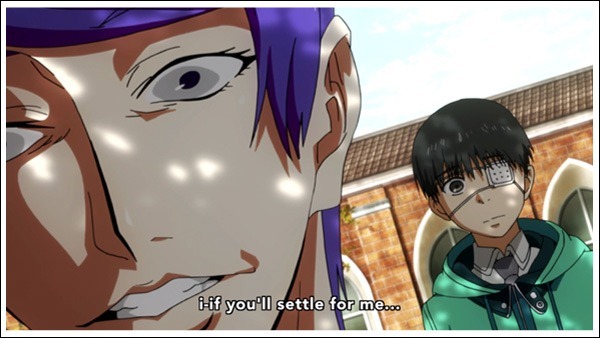 I’m not sure what to think of Tsukiyama as a villain or a character. 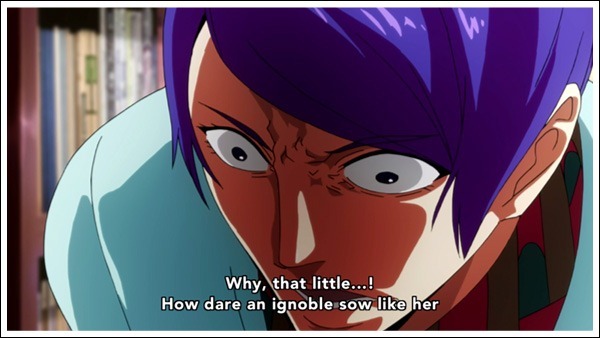 He certainly doesn’t have any endearing factors like Rize, who managed to play it much cooler than Tsukiyama did before she revealed her true intentions. Mamo-chan is an excellent choice for him, though, because he can sound all intellectual and charming, and then turn into the creepiest of all creeps in the next scene. Hanazawa’s performance as Rize is still amazing, and I’m glad to see her in a kind of role that she’s never really been cast as before. I’m excited for the next episode in hopes that more about Rize’s mystery will be uncovered. As much as I love Mamo-chan and am glad that he’s back in the voice-acting gig, I kind of want Tsukiyama “Stranger Danger Douche Train” Shu to stay away. Right now, the strongest suspect in Rize’s death is Tsukiyama, due to the fact that he is just so disgustingly evil and has a vendetta against Rize. However, I don’t believe that he is the one who did her in. It seems a little too obvious. I will hold off judgment until we get more information. Overall Enjoyment: 9/10. Like, okay, Tsukiyama grosses me out, but I love Mamo, and this episode was pretty cool in what we get to learn about the plot.